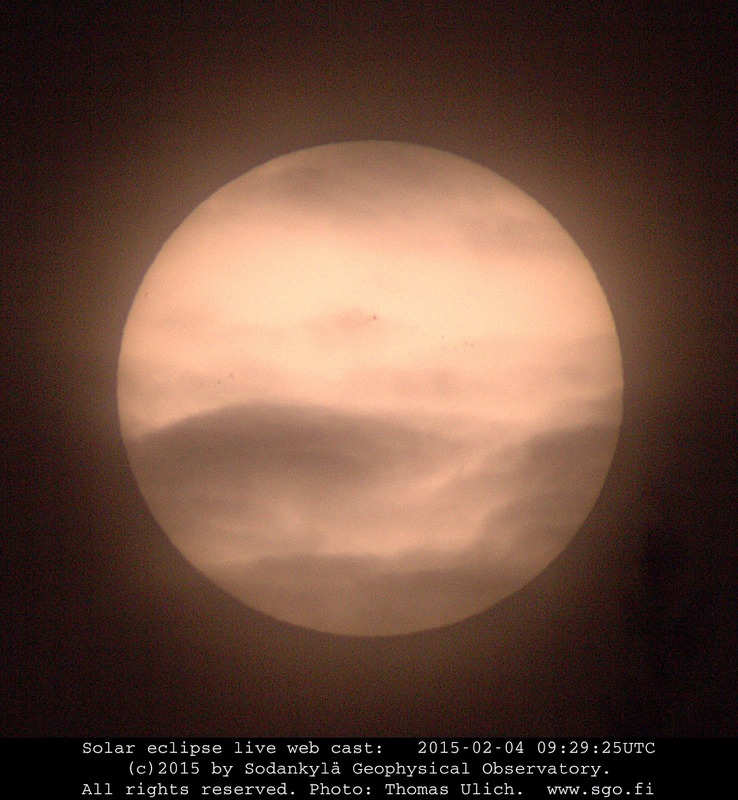 Above is a photo of the Sun, taken on 4th February, 2015, at Oulanka Research Station. Unfortunately thin clouds made observation and focusing difficult. The photo is a test shot to see how the equipment will perform during Sodankylä Geophysical Observatory's live webcasting of the solar eclipse on 20th March, 2015. See SGO's blog for more information. Here, I want to discuss a few technicalities, which will make a live web cast possible. The setup for the image above as well as the web cast will be as follows: a full-frame Canon EOS 6D will be tethered to a MacBook, and fitted with a 2x converter as well as a Tamron f/5.6 200-400 mm zoom lens giving an image of the Sun of a bit over 1000x1000 pixels. Most importantly, the lens opening facing the Sun will be covered with "AstroSolar" folio, which in Finland you can buy, e.g., here. First, a word of warning: Do not look at the Sun without this folio! If you intend to use welding goggles, make sure they are at least factor 13 or darker! The sunlight can destroy your eyes, and you won't notice it at the time of observation, but only afterwards. As discussed recently with respect to photographing the Northern Lights, in order to prevent stars to appear elongated due to the Earth's rotation, the exposure time, in seconds, must be chosen to be less than 500 divided by focal length. The above setup yields a total focal length of 800 mm: 500/800 = 0.625 seconds. Thus an exposure time of half a second or faster is sufficient. The aperture will be set at the widest possible, which means f/5.6 here. But the 2x converter reduces the aperture by two stops, thus the combined f-stop above is f/11. It turns out that at f/11 with the AstroSolar folio in place, the exposure time needed for the above image was 1/100 s, thus no problem with blur due to Earth's rotation. However, the field of view of an 800 mm lens is only about 3.1° (diameter), and therefore I will have to readjust the pointing direction constantly in order to keep the Sun in the field of view. This means that in the camera image frame, the Sun will appear in different locations due to my manual pointing. In order to get neat, full resolution, and fairly similar images throughout the event, I wrote a software, which centres on the Sun and then crops the image around the Sun at 1500x1500 pixels. How does that work? First, I decode the RAW file (.CR2) using a utility called dcraw, which will develop it into a .ppm file. This file is then further processed using the fantastic ImageMagick tools. First, it is converted into pure black and white, meaning there are only two colours left (use -threshold). Then, using the -fuzz option, the crop geometry is obtained. However, this is a tight crop, which is not very pleasing, and thus it is easily converted into something a bit bigger than the Sun, with the Sun in the centre. Some sharpening is then applied. Finally, the time stamp and copyright texts are placed under the image using the label: option. The last step is to use exiftool to copy the EXIF data from the RAW file to the final JPG. The last step will be to copy the image to a web server, but the address has not yet been agreed upon and thus this step is still missing. The photo above does not have any other modifications done to it, no lens correction, no contrast or brightness adjustments. Text and photo: Thomas Ulich. PS: You can download the source code for that software from our server here.